By April 1942, the Pentagon was 40 percent over budget, partly because it had been enlarged since first approved, but mostly because the original estimate of $35 million had never been realistic. Lieutenant General Brehon Somervell delayed telling Congress, but in June he finally sent Colonel Leslie Groves to appear before a House Apppropriations subcommittee. No protest was raised at the increased size or cost. Instead, much of the hearing dealt with complaints that the floors of the Pentagon were dusty. "We can get rid of the dust inside the building, but we cannot get rid of the dust outside, and it keeps coming in," Groves explained. [Captain Clarence] Renshaw was increduluous; they had been dreading Congress's reaction to the overrun, and all the members cared about was the dust. "They listened to a $15 million deficit, and swallowed it without a comment," he afterward told George Holmes, Somervell's PR man. "When somebody said there was dust on the floors, they sent for me to come up and explain it." Oversight committees can be at once nitpicking about small matters and inattentive to large concerns. Not everyone gets this. Consider Carl Elliott, who has done heroic work bringing to light the case of Dan Markingson, who committed suicide while enrolled in a University of Minnesota trial of anti-psychotic drugs. Given his outrage over the university's treatment of Markingson, and over its conduct after Markingson's death, Elliott can't understand why university president Eric Kaler would proclaim "a quest to 'free' our organization from unnecessary administrative burden—those that we impose on ourselves because we have a low tolerance for risk, or because we’re afraid a misdeed of two decades ago will reappear again." the current problems at the university are not the result of any excessive regulatory burden. They are the result of industry-funded university investigators ignoring research regulations, repeatedly failing to meet their ethical obligations, and fearing no sanctions whatsoever. University officials have repeatedly defended this misconduct or looked the other way. To suggest that the university needs to "recalibrate its risk tolerance" is an insult to the research subjects who are being asked to bear those risks. Well, some problems come from too little regulation, and some come from too much. This is Alice Dreger's conclusion as she looks at the Markingson case and joins a petition for the governor of Minneosta to investigate the case as potential research misconduct. Even as she does so, she notes that "many social scientists are quite reasonably fed up with the way in which IRBs have evolved to the point where they attempt to hyper-regulate our work, often forcing us to adhere to systems that make no sense for our disciplines." 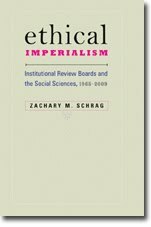 I would argue that the mistreatment of social scientists and the failure to really police dangerous medical studies are two sides of the same coin: both cases show how IRBs and the OHRP are failing to focus on what really matters -- the protection of human subjects in genuinely dangerous research. While IRBs fret about dust on the floors, participants in medical trials die. I worry about the consequences of the petition drive. In the past, the regulatory response to abuses by biomedical researchers has been to make life harder for social scientists. I can imagine the University of Minnesota responding to a state investigation not by cleaning up its lucrative drug trials but by making its geographers jump through more silly hoops. But what is that compared to a chance for justice for Dan Markingson? I will sign the petition.